Thanks to Apple and Samsung, the era of rapid mobilisation is fast upon us. Smartphones will replace wallets (ok, partially) and your phone will hold digital discount coupons, cinema and airplane tickets, club memberships and, maybe even, Rugby 7s tickets! [For iPhone, read more about Passbook. For Android phones, check Google Now]. 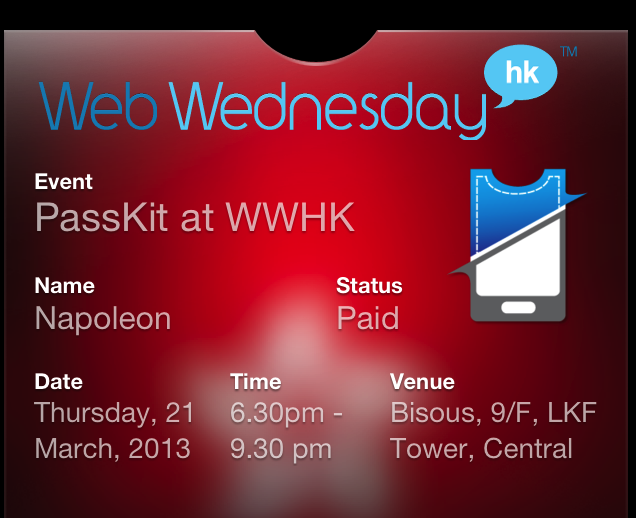 To usher in this mobile revolution, we've invited Paul Tomes, successful Hong Kong start-up and purveyor of PassKit, to speak at our 68th social mixer on THURSDAY 21st March, 2013. [You can blame the New Zealand All Blacks for scrumming us out of our usual Wednesday slot!]. Mixing starts at 6:30pm and continues until 9:30pm with the interview at 7:15pm. We've lined up a few rugby-related benefits so bring along some analog pals! Keep the pass so that we can dynamically update you about upcoming Web Wednesday events. Let's mobilise Hong Kong together!